Kettering Town report back for pre-season training next Tuesday. The winds of change have swept through Latimer Park over the summer following the return of Marcus Law as manager. 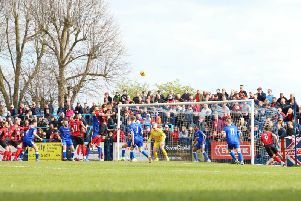 He replaced Thomas Baillie and Scott Machin with the Poppies keen to have just one manager in charge as they head into the Evo-Stik Southern League Premier Division following their rampant Division One Central title success last season. A number of the squad who helped secure title glory have already departed and Law looks set to throw a new-look Poppies squad together over the next few weeks. He has, so far, kept his cards close to his chest when it has come to new additions, of which there will be plenty. But Elliot Sandy confirmed he will be staying with the club and that was soon followed by the news that Gary Mulligan will also be back at Latimer Park next season. Striker Mulligan had an impressive impact during the latter stages of the last campaign and showed his versatility with a number of good performances in midfield. And the Irishman, who won the Southern League Premier Division alongside Sandy and Brett Solkhon, who is also set to stay at Kettering, at Brackley Town, is keen to look forward as Law begins his preparations for the new season. “It’s been seven weeks since the season finished but pre-season seems to come round quicker every year,” Mulligan said. “I am looking forward to getting back to it. It will be interesting on Tuesday because I am sure there will be a lot of new faces. “We had our chat with the new manager and he told us his plans. “Staying at Kettering was the best option for me and I knew Elliot and Brett were both wanting to stay as well. “There was interest from a couple of clubs but I was happy with how things went and I really enjoyed the last 15 or 16 games of the season. Mulligan, meanwhile, is hopeful Kettering will mount a challenge at the right end of the table next season. “I haven’t worked with the manager before so it is a new one for me,” he added. “But I am sure we will all want the same thing. “I have played at this level before and won the division so I know what it’s all about. The Poppies are holding a Volunteer Day at Latimer Park tomorrow (Saturday). Fans are being encouraged to go to the ground to help with a number of tasks as the club gears up for the new campaign. The tasks include general tidying up, some painting, cleaning of stand areas, moving of waste and levelling standing areas. The day will start at 9am with tea, coffee, soft rolls and soft drinks available in the clubhouse and Latimer Park will be open until 5pm.